ML1RADG is the EOS Aura Microwave Limb Sounder (MLS) product containing the level 1 radiances from the filter banks for the GHz radiometers. The data version is 3.3/3.4. Data coverage is from August 8, 2004 to current. Spatial coverage is near-global (-82 degrees to +82 degrees latitude), and files contain a full days worth of data (15 orbits). Users of the ML1RADG data product should read the 'A Short Guide to the Use and Interpretation of v3.3/v3.4 Level 1 Data' document for additional information. The data are stored in the version 5 Hierarchical Data Format, or HDF-5. Each file contains radiances and ancillary information written as HDF-5 dataset objects (n-dimensional arrays), along with file attributes and metadata. 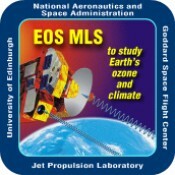 Effective use of EOS MLS Level 1 requires detailed knowledge of the instrument and its inner workings, and the Level 1 data should not be used prior to consulting with relevant members of the MLS Science Team in order to obtain requisite information. Users are encouraged to register with the MLS science team to obtain updates and information about this data product. MLS Science Team Home Page. Aura No campaigns listed. No dates provided.